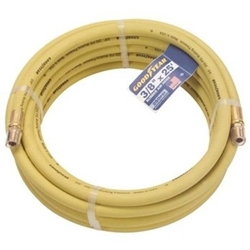 Yellow Rubber Air Hose 50' x 3/8" with 1/4" NPT BOWES HO AH-945Y. Designed for tough service station and shop air tool applications. It features an EPDM tube and cover with a four spiral polyester reinforcement that keeps the hose kink resistant and flexible in extreme temperatures. The cover is resistant to abrasion, weathering, and ozone. Available coupled with brass fittings or uncoupled on reels. Also available with an attractive advertising disk for retail sales. Rated at 250 psi working pressure.